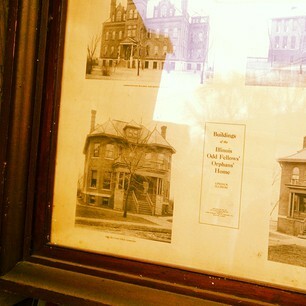 Buildings of the Odd Fellows’ Orphans’ Home, framed, submitted to alley, accepted by me. I got my favorite rejection of the year in the mail the other day. As a writer, I’m supposed to be used to rejection, but I’m not. I never got rejected from this particular place for that particular piece before, so it’s always happening for the first time. And as someone who’s done my share of rejecting, I should remember that not everyone’s performance or piece is right for whatever I’m casting or curating, so I should remember it’s not often so much about rejection as it is about incompatibility, but I don’t. And as my job hunting friends tell me, I should be grateful even for rejections, because someone cared enough to say no, thanks. Apparently the trend in employment these days is, if you don’t hear from us, consider it a no. Thanks. Yeah, I guess, but it still stings. Except for the times when it doesn’t. Like this one. It wasn’t one of those personalized “Your play is amazing but we don’t have the budget for your time machine set piece” or “The writing is so brilliant even we don’t understand it “ sorts of letters. There wasn’t even a scrawled postscript about how I should send in something else because they liked my voice. It was just a form letter on cheap paper telling me that my play, “Charlie,” wasn’t selected for their ten-minute musical project. Two things stopped me from feeling bad about it, maybe three. First, the letter said that not only wasn’t “Charlie” selected, but no one’s play was selected. Which made me feel included instead of excluded. I like feeling included, which apparently is okay because that’s part of being human. Also, the letter advised all us rejects to pay more attention to story, because plot was mostly where these pieces disappointed. It recommended more adaptations. I can take or leave the advice, but at least I have a sense of why they didn’t like my very small story with some big songs (composed by creative wonderbox Charlie – oh, btw, Charlie, we didn’t get in – Hopper). There’s something lovely about a rejection that reveals just a little of what’s behind the no. It demystifies the whole process in a way that makes me feel less generally inadequate, and more specifically incompatible. Rejections also feel better when tempered with acceptances. This morning, I got an email with a link to a tiny radio play I wrote, “Go,” which is presented as part of this week’s episode of Chicago Off Book. It’s a smart, fast, funny show that makes me want to go see more theatre. I hope you’ll listen to it—and not just to my 60 seconds of silliness. Arlene Malinowski also has a mini-play in this episode, and there are interviews with Michael Halberstam and Darrell Cox. Ironically, when something of mine is accepted, I don’t feel a huge rush of artistic triumph. I just think, oh, good, for some reason that worked for them. It boosts my confidence enough to think about sending out more work, and more importantly, it’s the point of the whole endeavor – to share my work, my view, my experiences, with whoever might care to listen. Like most things I write, both “Charlie” and “Go” are on actual events: one I overheard at a bookstore, and one I saw backstage at a theatre. The more I write, the more I discover specifically what kind of writer I am: an interpreter of the small and forgotten. And I’m proud of it. If you too are someone who auditions, submits, sells, offers yourself parsed out in words or images or knitted hoodies or carved dogs, I hope you’ll keep at it. Because there may be only a few people in this entire universe who really “get” your handmade astrology-themed earbud cozies, but wouldn’t it feel good to connect with them? Hey, I’ve been looking for my cozies. Did you steal them? I love your description of your niche as a writer- an interpreter of the small and forgotten. I often read your blog and find myself thinking how interesting the seemingly mundane aspects of daily life are under your observation. And that’s why I keep reading everything you post here, and why we so often show up for your readings. Brilliant! And I love the Odd Fellows Orphans Home buildings, submitted to the alley, accepted by you. A lovely, poetic accompaniment to what you wrote. Which you have a gift for. BTW. I recently submitted some old socks to the alley. They were not accepted. It was clear, however that they had been examined. But not accepted. After a few days of seeing them sit out, and concerned that rain was coming I submitted them to the nearby dumpster, where they were accepted! I am so glad the socks found acceptance and recognition at last. It’s hard for socks. So much of the time they are hidden behind shoes, or in the laundry, or in the drawer. Their perseverance is a lesson to us all. That’s about the nicest thing I could imagine reading. Thank you, and thanks for caring about the small stuff as much as I do. MT, as usual your writing is endearing, funny, and true. As someone who has spent most of his life getting rejected for a living, I appreciate and can relate to your perspetive on the subject. I love that you have found such a positive approach to your recent rejection. That’s the real victory. Because here’s the thing: As long as I have known you (which is by now a frighteningly lengthy stretch), you have consistently been pursuing your creative endeavours, your craft, your passion… finding new and interesting ways to express yourself and share (nay, not just share… but “find, define and refine”) your voice. You do not give up. You continue. No matter how many a rejection letter you get, you continue. You are yourself. You win. The negative stuff is easier to believe. That’s science. But we can allow ourselves, encourage ourselves, to find the Positive. To believe the Positive. If you have the choice to decide how to respond or react to a stimuli (say, a delightfully formulaic rejection letter, for example… or the lingering, deafening silence of a non-responsive organization/job opportunity/theatre), you can find extraordinary personal power by finding and believing the Positive. So, here’s the real Positive… you got rejected, you wrote a blog entry about it, we get our fix. Win-win-win. Damn, that’s good stuff. Don’t stop. MT, What Aaron said. And everybody. And, this is the best description of the life of rejection of the writer/artist that I have ever read. Haha, Mark! Yes. Ah, yes. Thanks to all of you for reading, and for making art that I love to read, watch, laugh at, and listen to. Pretty damned, cool, being on earth at the same time as you guys. I believe in your realization that rejection is sometimes only incompatibility. That is very encouraging. Thanks for sharing your wisdom…as always!